(2018-2019) D39C Collaborative Get Informed. Get Involved. Give Back. Please use one you check regularly. 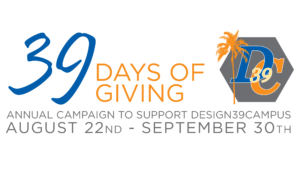 To donate, ensure the number of Design39Campus student count is greater than 0. Additional fields will appear. If “Yes,” please file the appropriate paperwork with your matching program administrator. They will then contact The D39C Collaborative! Click the 'Double The Donation' image to the right to get more information. May we publicly acknowledge your family’s last name(s) on our annual donor recognition feature? * Cutoff for inclusion on our annual donor recognition statue is March 1, 2019. If so, please indicate your family's last name preference for our annual donor recognition feature. Please click in the reCAPTCHA checkbox next to 'I'm not a robot'. You may be asked to select 1 or 2 pictures to confirm you are a real person and not an electronic program. If you are making a donation, you will be redirected to PayPal for online payment.